South Korean officials have begun dismantling the country’s largest canine slaughterhouse complex, as animal rights activists push to end the custom of eating dog meat. About 1 million dogs are eaten each year in South Korea, often as a summertime delicacy. The greasy red meat is believed to increase energy. But the tradition – much criticised by westerners – has declined as South Koreans have increasingly chosen to keep dogs as pets, and eating dog meat is taboo among some younger South Koreans. 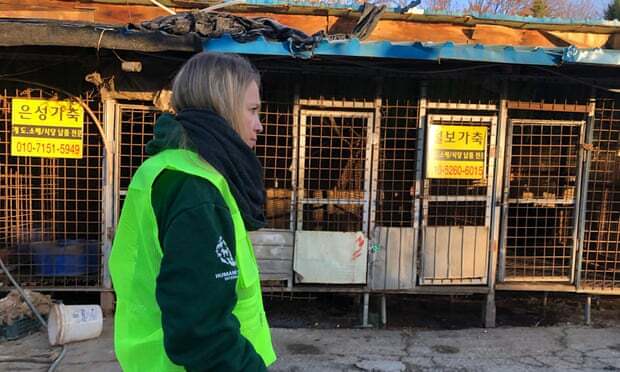 The Taepyeong-dong complex in Seongnam city, south of Seoul, housed at least six dog slaughterhouses that could hold several hundred animals at a time, and was a major source of dog meat for restaurants across the country. The site will be cleared over two days and transformed into a public park, Seongnam city officials said. Animal rights campaigners criticised slaughterhouse managers for mistreating the dogs, and electrocuting and butchering them in sight of other caged dogs. Campaigners from Humane Society International described conditions inside the complex as “horrifying”. They found a large number of empty wire pens that would once have held hundreds of dogs, as well as the electrocution equipment used to kill them, knives, and a de-hairing machine. A pile of dead dogs was also found abandoned on the floor. “Both as a Korean citizen and an animal campaigner, it was incredibly moving for me to be part of the historic closure of this notorious dog slaughterhouse,” Nara Kim, HSI Korea’s dog meat campaigner, said. According to a survey last year, 70% of South Koreans do not eat dogs, but far fewer – about 40 % – believe the practice should be banned. It also found 65% support for raising and slaughtering dogs in more humane conditions. There are no laws on how to treat or slaughter canines for meat in South Korea. While farmers have urged Seoul to include dogs under livestock welfare regulations, animal rights groups oppose doing so, seeking abolition instead.